Our Abpromise guarantee covers the use of ab55051 in the following tested applications. WB Use a concentration of 1 - 5 µg/ml. Predicted molecular weight: 108 kDa. Flow Cyt Use 0.5µg for 106 cells. Receptor for GABA. The activity of this receptor is mediated by G-proteins that inhibit adenylyl cyclase activity, stimulates phospholipase A2, activates potassium channels, inactivates voltage-dependent calcium-channels and modulates inositol phospholipids hydrolysis. Plays a critical role in the fine-tuning of inhibitory synaptic transmission. Pre-synaptic GABA-B-R inhibit neurotransmitter release by down-regulating high-voltage activated calcium channels, whereas postsynaptic GABA-B-R decrease neuronal excitability by activating a prominent inwardly rectifying potassium (Kir) conductance that underlies the late inhibitory postsynaptic potentials. Not only implicated in synaptic inhibition but also in hippocampal long-term potentiation, slow wave sleep, muscle relaxation and antinociception. Activated by (-)-baclofen, cgp27492 and blocked by phaclofen. Isoform 1E function may be to regulate the availability of functional GABA-B-R1A/GABA-B-R2 heterodimers by competing for GABA-B-R2 dimerization. This could explain the observation that certain small molecule ligands exhibit differential affinity for central versus peripheral sites. Highly expressed in brain and weakly in heart, small intestine and uterus. Isoform 1A is mostly expressed in granular cell and molecular layer. Isoform 1B is mostly expressed in Purkinje cells. Isoform 1E is predominantly expressed in peripheral tissues as kidney, lung, trachea, colon, small intestine, stomach, bone marrow, thymus and mammary gland. Belongs to the G-protein coupled receptor 3 family. GABA-B receptor subfamily. Contains 2 Sushi (CCP/SCR) domains. Alpha-helical parts of the C-terminal intracellular region mediate heterodimeric interaction with GABA-B receptor 2. The linker region between the transmembrane domain 3 (TM3) and the transmembrane domain 4 (TM4) probably play a role in the specificity for G-protein coupling. Secreted and Cell membrane. Cell junction > synapse > postsynaptic cell membrane. Colocalizes with ATF4 in hippocampal neuron dendritic membranes (By similarity). Moreover coexpression of GABA-B-R1 and GABA-B-R2 appears to be a prerequisite for maturation and transport of GABA-B-R1 to the plasma membrane. 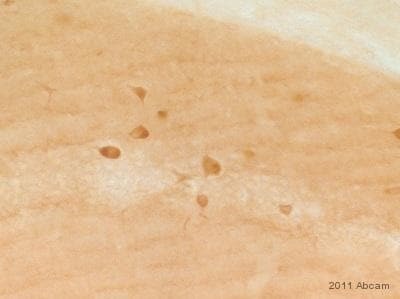 ab55051 staining rat brain (hippocampus) sections by IHC-Fr. The sections were fixed with 4% paraformaldehyde in 0.3% PBS-Tween for 1h. Staining with ab5505 at a 1/1000 dilution in PBS-Triton (0.3%) with 0.02% azide was performed for 24h at 24°C. A donkey anti-rabbit Alexa568 polyclonal antibody at 1/1000 was used as the secondary antibody. DAPI was used to stain the cell nuclei (blue) at a concentration of 1.43µM. 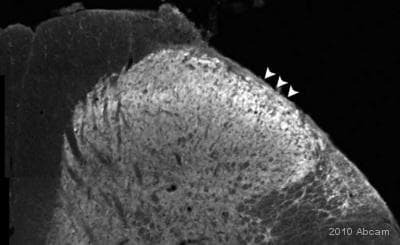 GABA-B R1 expressed in the hippocampal neurons. ICC/IF image of ab55051 stained SHSY5Y cells. The cells were 4% formaldehyde fixed (10 min) and then incubated in 1%BSA / 10% normal goat serum / 0.3M glycine in 0.1% PBS-Tween for 1h to permeabilise the cells and block non-specific protein-protein interactions. The cells were then incubated with the antibody (ab55051, 5µg/ml) overnight at +4°C. The secondary antibody (green) was Alexa Fluor® 488 goat anti-mouse IgG (H+L) used at a 1/1000 dilution for 1h. Alexa Fluor® 594 WGA was used to label plasma membranes (red) at a 1/200 dilution for 1h. DAPI was used to stain the cell nuclei (blue) at a concentration of 1.43µM. ab55051 staining GABA B receptor 1 in SK-N-SH cells treated with L-Glutamate (ab120049), by ICC/IF. Internalization of GABA B receptor 1 correlates with increased concentration of L-Glutamate, as described in literature. The cells were incubated at 37°C for 30 minutes in media containing different concentrations of ab120049 (L-Glutamate) in DMSO, fixed with 4% formaldehyde for 10 minutes at room temperature and blocked with PBS containing 10% goat serum, 0.3 M glycine, 1% BSA and 0.1% tween for 2h at room temperature. Staining of the treated cells with ab55051 (1 µg/ml) was performed overnight at 4°C in PBS containing 1% BSA and 0.1% tween. A DyLight 488 goat anti-mouse polyclonal antibody (ab96879) at 1/250 dilution was used as the secondary antibody. Nuclei were counterstained with DAPI and are shown in blue. GABA B Receptor 1 antibody (ab55051) at 1ug/lane + IMR-32 cell lysate at 25ug/lane. Immunohistochemistical detection of GABA B Receptor 1 antibody (ab55051) in PFA perfusion-fixed rat spinal cord section. ab55051 was used at 1/500, incubated for 18 hours @ 20°C in PBS-T 0.3%. Secondary antibody: Alexa Fluor® 546 anti-IgG Mouse (1/1000). Overlay histogram showing SH-SY5Y cells stained with ab55051 (red line). The cells were fixed with 4% paraformaldehyde (10 min) and then permeabilized with 0.1% PBS-Tween for 20 min. The cells were then incubated in 1x PBS / 10% normal goat serum / 0.3M glycine to block non-specific protein-protein interactions followed by the antibody (ab55051, 0.5µg/1x106 cells) for 30 min at 22ºC. The secondary antibody used was DyLight® 488 goat anti-mouse IgG (H+L) (ab96879) at 1/500 dilution for 30 min at 22ºC. Isotype control antibody (black line) was mouse IgG2a [ICIGG2A] (ab91361, 1µg/1x106 cells) used under the same conditions. Acquisition of >5,000 events was performed. This antibody gave a positive signal in SH-SY5Y cells fixed with 80% methanol (5 min)/permeabilized with 0.1% PBS-Tween for 20 min used under the same conditions. ab55051 staining GABA B receptor 1 in SK-N-SH cells treated with NMDA (ab120052), by ICC/IF. Internalization of GABA B receptor 1 correlates with increased concentration of NMDA, as described in literature. The cells were incubated at 37°C for 30 minutes in media containing different concentrations of ab120052 (NMDA) in DMSO, fixed with 4% formaldehyde for 10 minutes at room temperature and blocked with PBS containing 10% goat serum, 0.3 M glycine, 1% BSA and 0.1% tween for 2h at room temperature. Staining of the treated cells with ab55051 (1 µg/ml) was performed overnight at 4°C in PBS containing 1% BSA and 0.1% tween. A DyLight 488 goat anti-mouse polyclonal antibody (ab96879) at 1/250 dilution was used as the secondary antibody. Nuclei were counterstained with DAPI and are shown in blue. Publishing research using ab55051? Please let us know so that we can cite the reference in this datasheet. Thank you so much for your response. We would like to take advantage of this program and order 3 antibodies. Just to clarify once we submit Abreview with our Flow cytometry data (positive or negative) we will get 3 antibodies for free? Is that correct? We would be interested in getting the following antibodies: Anti GABA A receptor alpha 1 subunit antibody: ab33299 (https://www.abcam.com/GABA-A-Receptor-alpha-1-antibody-ab33299.html) Anti GABA A receptor beta 2 subunit antibody: Ab42598 (https://www.abcam.com/GABA-A-Receptor-beta-2-antibody-ab42598.html) Anti GABA B receptor 1 antibody: ab55051 (https://www.abcam.com/GABA-B-Receptor-1-antibody-ab55051.html) Please let me know if there is a particular quote number we should use while ordering? Thank you for the information. I am very pleased to hear you would like to accept our offer and test these products in Flow Cytometry. Each code will give you: 1 free PRIMARY ANTIBODY OR VALUE OFF OF ORDER before the expiration date. To redeem this offer, please submit an Abreview for Flow Cytometry for the product and include the related code in the “Additional Comments” section so we know the Abreview is for this promotion. For more information on how to submit an Abreview, please visit the site: www.abcam.com/Abreviews. You do not need to referencea quote number when ordering these products. Remember, we publish both positive and negative Abreviews on our datasheets so please submit the results of your tests. The code will be active once the Abreview has been submitted and can be redeemed in one of the following ways: 1) Call to place your order and mention the code to our customer service department; 2) Include the code in your fax order; 3) Place your order on the web and enter the promotional code. Any feedback that you can provide will be greatly appreciated, whether positive or negative. If you have any further questions, please do not hesitate to contact us. We look forward to receiving your Abreview and wish you luck with your research. The terms and conditions applicable to this offer can be found here: www.abcam.com/collaborationdiscount. I have had a chance to review each of the product which you have listed as well as our other products against the same targets. I would like to offer some recommendations. 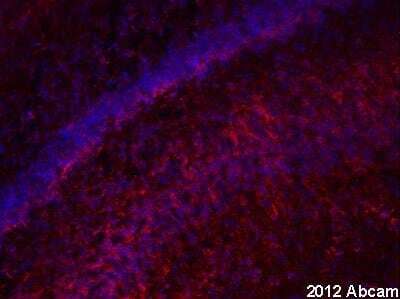 Anti GABA A receptor alpha 1 subunit antibody: ab33299 (https://www.abcam.com/GABA-A-Receptor-alpha-1-antibody-ab33299.html) and ab86320 (https://www.abcam.com/GABA-A-Receptor-alpha-1-antibody-ab86320.html) will both recognize the extracellular region of this protein in human tissue. Each will work as well as the other with the only difference being that ab86320 was created fromHuman GABA A Receptor alpha 1 andhas 100% homology, while ab33299 is created fromRat GABA A Receptor alpha 1with 93% homology. Anti GABA A receptor beta 2 subunit antibody: Ab42598 (https://www.abcam.com/GABA-A-Receptor-beta-2-antibody-ab42598.html)is raised against the extracellular region of this protein and will react with human tissues. Anti GABA B receptor 1 antibody: ab90883 (https://www.abcam.com/GABA-B-Receptor-1-antibody-ab90883.html) recognizes a cytoplasmic region of this protein and will require permeabilzation of the cells to be effective. Alternately ab55051 (https://www.abcam.com/GABA-B-Receptor-1-antibody-ab55051.html) recognizes the extracellular region of this protein. This will also work with human tissues. The testing discount program is for customers who like to use an antibody/protein on an untested species/application. You would purchase the antibody at full price, test it and submit an Abreview with your data (positive or negative). On your next order you will receive a discount for ONE antibody at the full price (100%) of the antibody you have tested. The terms and conditions applicable to this offer can be found here: https://www.abcam.com/collaborationdiscount. I hope this information is helpful to you. Please let me know if you have any questions or would like to take advantage of our testing discount with these products. After a few optimization process, I have attached pictures of WB with ab75239 (and ab55051 if it helps you) for abreview. In both cases, samples are the same (rat brain homogenates). We purchased ab55051 first and we were upset with so many bands. So, you kindly sent me ab75239 for abreview. With both Abs, there are 4-5 bands, including the ones around 95kDa & 130kDa. 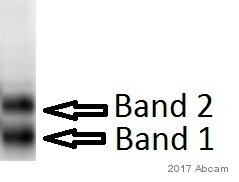 I think these bands are GABAb-R1B/C/D & -R1A/E since GABAb-Rs are supposed to be R1D (91kDa), R1B (95kDa), R1C (98kDa), and & R1A (108kDa), R1E (12kDa). If I should change something or providew you additional information, please let me know. Thank you for your kindness again. PS: We are out of BCA Kit now and ordering it. So, we don't know the [protein] at all. Instead, I calculated wet weight of brain tissue before homogenization in RIPA buffer. Once BCA kit comes, I can give you the estimated [protein]. Thanks so much for sending the results and for keeping me updated. I'm sorry to see that the antibody is still picking up so many bands, however you may be correct that some of the bands are isoforms of the target protein. In order for the Abreview to display on the datasheet, the information needs to be submitted at the "Submit an Abreview" link on our datasheet. This link will take you to a form with questions about your protocol, and you can also add the image to the review. If you have any questions about the review form, please let me know and I'd be happy to help. Let me know if you have any questions or if there is anything else that we can do for you.